Prevent email tampering, authenticate users and manage certificates from one platform for all devices. Master mobile email and application rollouts, safeguard mobile data and devices, and get comprehensive visibility of your mobile environment. The proven, cost-effective way to secure all end-to-end communication points and automate management for corporate access. 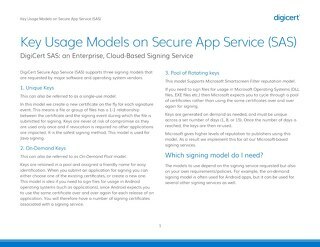 Learn about DigiCert SAS: an enterprise, cloud-based signing service. 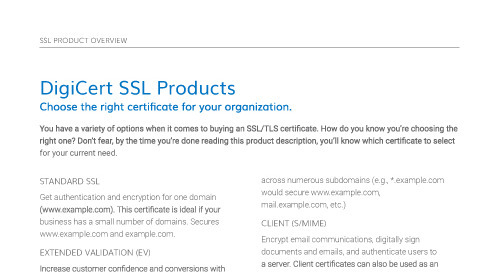 Get a complete list of DigiCert's SSL products with descriptions to help you decide which are the best fit for your security needs. DigiCert's Trusted Root Certificates are compatible with all of the top browsers and platforms. See overall ubiquity percentages for these Roots and minimum versions required for compatibility. From small businesses to Fortune 500 companies, brands around the world choose DigiCert for authentication, encryption, and identity solutions. See why you'd be in good company. From market-leading tools to 24/7 technical support, find out why you should choose DigiCert for your SSL and PKI needs. 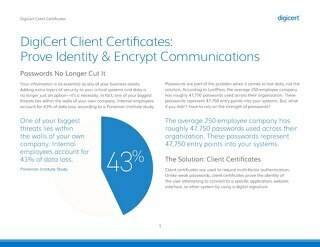 Using the DigiCert Private PKI solution allows you to request and manage internal certificates with ease, either through the account user interface or API. Your users are asking: "Can I trust this code?" 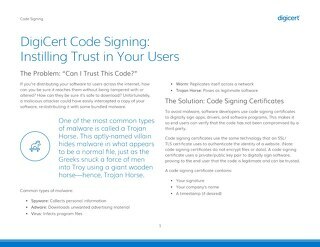 When you use a code signing certificate, they can. Learn more about our solution. Here are the outlined costs of building an internal private PKI versus choosing a DigiCert-hosted private PKI. 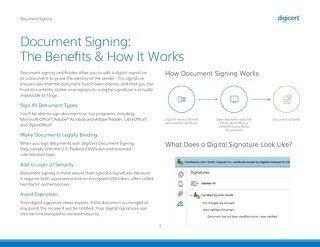 Document signing certificates allow you to add a digital signature to a document to prove the identity of the sender and ensure the contents haven't been changed. Learn more. Learn about highlights and features of DigiCert's leading discovery tool: Certificate Inspector. For the enterprise, passwords no longer cut it. Learn how Client Certificates are used as multi-factor authentication and why they work to prove identity.